It’s time for marketers to wake up and learn that if you are not interacting with your audience, you will be ignored. No one wants to be ignored, right? So hold on to your lunch, as we are about to explore the top 3 interactive techniques that will WOW your audience. Interactive video marketing differs from “normal static video advertisements” by providing your audience with the choice of interacting with the video instead of simply just watching it. Viewers can interact through physical actions such as touching or clicking. By inviting your viewer to act, you can effectively boost engagement of your videos. Interactive videos can easily convert leads through well-timed call to actions. Still scratching your head? Don’t worry; it is illustrated in detail below. 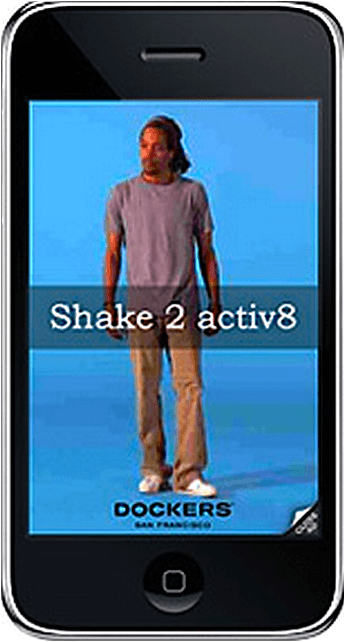 Add interactive hotspots: Interactive hotspots are motion tracking ‘tags’ that you can use to add objects and people within your video. These hotspots give your audience the chance to click links or learn more info about your product all from within your video. An example of an interactive hotspot could be clicking on the collar of a cat in a video to reveal info on collars, scratching toys, or to be linked to a website to buy cat collars. Choose the path: Another effective way to use interactive video is through a storytelling approach. Philips, one of the most reputable brands for electric razors, used their “Designed to Play” interactive video advertisement to create a story with different scenarios. 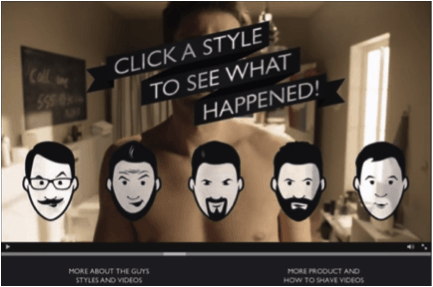 Within the advertisement Philips gives viewers the choice to “click a beard” and follow that story. This choice turns the ad from a boring video “ad” into a form of entertaining media. Allowing the viewer to interact helps him or her pay closer attention to the content. To watch the full interactive Philips advertisement, click here. Takeaway: Marketers should expand their horizons when it comes to video and embrace new interactive design possibilities. If you act too slowly, the more innovative brands will strengthen their position, and receive drastically higher engagement with their consumers. Furthermore they will cement their position as innovators by being an early adopter, while you are stuck watching paint dry on the sidelines. To generate attention today from consumers, marketers must stimulate the receivers’ brain with creative methods. The foundation of reveal-based marketing is simple: A consumer is tempted and tantalized by the inability to touch, see, or hear due to a “created” barrier delaying their immediate gratification. It invokes a strong curiosity, focusing on our desire for answers. In essence, humans want to be intrigued, excited, and ultimately blown away. Takeaway: With the advance in technology, digital reveal-based marketing has been producing great results. Need proof? According to Adweek, a recent Macy’s “reveal based” banner ad saw “the average person spends more than three minutes interacting with the unit, and the interaction rate was 921 percent”. There are now a host of distribution channels that perfectly compliment this form of engagement including mobile, email, and social media. Effective audience feedback: Everyone wants feedback, but it can be a difficult question to ask. By using polls, you can ask your audience for their thoughts in a way that is easy, fast, and fun for them. Audiences love to see what others have to say too, so by adding a poll you will attract excitement. Engagement: Polls show your customers that the communication goes both ways, and it invites them to join in on the fun. It is a great technique for listening and shows them you care about their input. Double the Content: When you add a poll, you’re really adding two pieces of content: The actual poll itself, as well as a piece sharing the results. This way, your audience is interacting with your brand twice – once with the poll through voting, and again with the results through commenting. If it is an intriguing poll, both of these pieces may end up going viral, which is an added bonus. Polldaddy is an easy-to-use survey software. With the software, you have the ability to create polls, surveys, quizzes, and ratings. Wedgies is a simple and interactive tool that that can be easily embedded in your blog posts. Poptip is a tool for real time polling that lets brands create and analyze instant polls on both Twitter and Facebook. 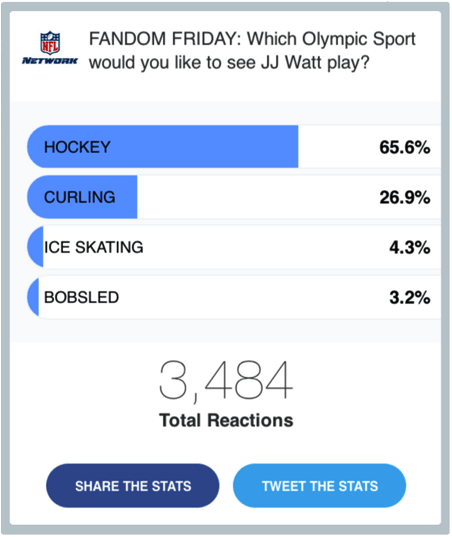 Takeaway: Through the use of polls you can interact, engage, and converse with your audience in a simple and effective way. Today, finding creative and interactive ways to engage with your audiences will spell the difference between a successfully thriving business – and a failed one. Try the techniques highlighted above you won’t just be delivering a message; you will be delivering an experience. What are you waiting for? Jared Flamm is a Marketer at Scratch-it. Formerly, Jared was the director of marketing at the Judicial Disqualification Resource Center. You can find him tweeting about Looney Tunes, email marketing, and the occasional succulent.